Describe an influential experience that led you to a year of service. During the summer after my junior year of college, I lead an immersion trip to Guatemala. Most of our time in Guatemala was spent with the people of Chinaulta, which is a small village on the outer end of Guatemala City that is known for its close connection with the Guatemala City garbage bump. The dump is a source of employment for many of the people who live in Chinaulta. The dump also backs up to the river that runs through town, contaminating the local water source. While we were there, our “service of doing” was to build bathrooms in three homes in the village. As we were working, talking, and laughing with the community of Chinaulta, I realized how much more meaningful our shared act of being together was in comparison to the physical service we were doing. Being unable to speak Spanish allowed me to listen in a new way to the community around me, forcing me to be attentive to the feelings and body language present in each interaction. I realized how impactful being present to a community of people is, even when few words are exchanged. Seeing the power of accompaniment led me to want to continue to grow in that practice and ultimately drove my decision to discern a year of service. 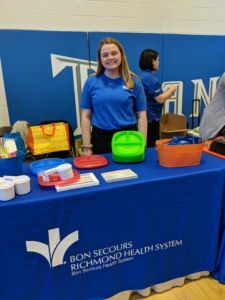 Bon Secours’ emphasis on community and accompaniment was a perfect fit. The intentionality that the program places on developing community in the area where we serve is an aspect that I really appreciate. This year has provided me the opportunity to grow in the practice of accompaniment by being a presence of hospitality and walking with the people of Church Hill in Richmond each day. Looking back on my trip to Guatemala, I am thankful for the emphasis on community and and accompaniment which the people of Chinaulta instilled in me. My grandma, Marge, has been to every state with the exception of Hawaii. She is a well-traveled woman within our country and age has not slowed her down. Last summer, my grandma, dad, and I went on a road trip to Aspen, Colorado, where we have family. Along the way, my grandma told us stories of her experiences in each state. She even pointed out the gas station that fixed her flat tire in Kansas. While a more time sensitive adventure is finding a way to get my grandma–a woman who is not fond of flying–to Hawaii, she has motivated me to travel to all 50 states in my lifetime, as well. My bucket list goal is to get to all 50 United States and all 7 continents. Currently, I have been to nineteen states and can only check North America off of my visited continents list, so I have a lot of travelling to do! Like my grandma I have strict requirements for how to define “visiting”. Passing through a state does not count. To count a place I must eat a meal there and do at least some walking around or site seeing. I have the blessing of being named after my Grandma Marge. Sharing a name has allowed us to share a special bond throughout the years. Hearing her stories from the many places she has visited has made me want to travel the states, too. Last summer was my first road trip, and it is fitting that I was able to share it with her. Hopefully, one day I will be as cool as my Grandma Marge.